All the Marketing Forms, Scripts, and Templates that have been tested and used to close 110+ transactions in a year with no assistants or admin help. Just fill in the blanks and you are ready to launch. BONUS: On Demand, 1-0n-1 Live Strategy Session. Go over your marketing campaigns, solve transaction problems...Ensure Your Success and Dominate Your Market! After our parents’ divorce, my brother, sister and I were left to get by on child support and my mother’s meager pay from the Bank of Columbia, in Columbia, Maryland. She soon lost that income due to serious back problems. I didn’t think of myself as poor. At that age I simply accepted everything as the way things were—for good or bad. We never wanted for food. I did wear hand-me-downs and other “free” clothes, and I was on the school lunch program. But more importantly, I had friends like Kevin McKinney, Tim Storch, and Johnny Rose, who lived in nice single-family homes in good neighborhoods. I was blessed enough to have examples of a better way of life as far as food, shelter and clothing went (okay, well at least shelter and clothing). I started to draw pictures of houses about that time and my paternal grandfather taught me how to draw floor plans according to scale and using the proper symbols for everything. My whole world opened up. Kevin McKinney’s father was an architect and they lived in an awesome contemporary house on Wild Lake. I was in my element and I had an awesome role model. I also knew that when I grew up I would live in an awesome house and drive an awesome car and I would provide the same for my Mom. I was blessed enough in college to be roommates with Socrates Demet. His father was a Greek immigrant who had built quite a portfolio in rental properties. Soc’s dad owned real estate around the Hopewell and Petersburg areas south of Richmond, Virginia. He also owned a beach house in Nags Head, North Carolina. After I graduated and got my first corporate 9-to-5 job, Soc and I were both in a position to once again be roommates. But this time it would be different. Soc asked if I wanted to buy a house together with him. His Dad thought it would be a good idea. He also offered to help us find a good deal and show us how to work a little magic while structuring the transaction. Our first selection missed the mark. It was a nice beach townhouse—a real chick magnet that currently had real chicks living in it (which may have clouded my judgment). We offered to buy that house about an hour after we saw it. Fortunately, Soc's Dad saved us from making a mistake before midnight. Eventually we did find the right property for us. Mr. Demet didn’t give us money, but rather he showed us how to invest properly. In other words, he didn’t give us a fish. He taught us how to fish! Now, with my passion for houses, my firsthand experience in real estate investing, and hands on training from Soc’s Dad, I was ready to pursue my dream of wealth built upon Real Estate. I believe with undying faith in the American Dream. It is alive and well for people, including those who are from foreign lands like Mr. Demet. I further believe that investing in Real Estate is the best path to realizing the American Dream. So congratulations! You are making a wise decision to participate in this program. I will teach you what I have learned—and not just how, but why certain techniques work the way they do. This is something I have found missing in a lot of courses I’ve taken and books I’ve read. 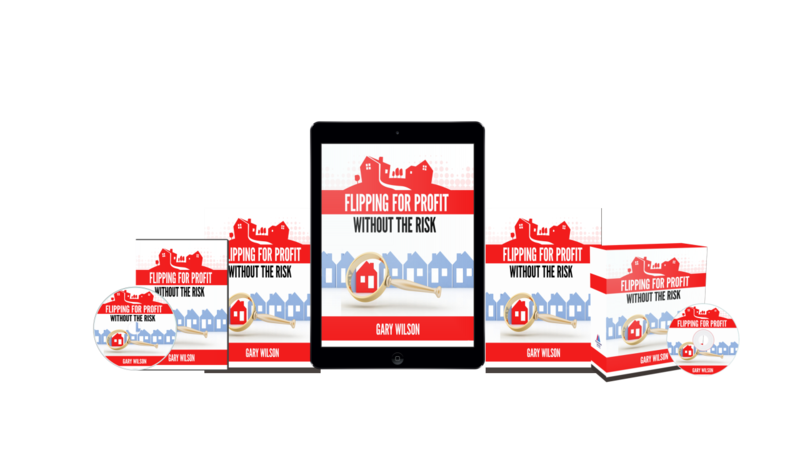 I promise that if you follow the suggestions in this training program, you will be Flipping for Profit Without the Risk. Time Tested, Proven Money Making Methods, In Every Market Large and Small. Fundamentals Don’t Change. By following the formula! Period! I discovered methods and tools I could use in any type of market. They work in every time because they are like natural laws. Natural laws don’t change. Only circumstances change and when you know how to use the methods and tools you know how to apply them in any market!! Then simply take action and repeat these same actions over and over again. And I’m going to show you exactly how. If you have tried and failed or haven’t even tried at all, then this is for you! How Will You Structure Your Investments? Some people try to sell you on a product. This is not my intention. Instead, I’m encouraging you to make a risk free investment into your Real Estate business. I’m not going to tell you that this is cheap. It is, however, a bargain, when you consider the value that you are getting. This is an amazing offer, so don’t waste any more time and ORDER RIGHT NOW! Still not convinced? Think about the cost of not using this system. How much money are you leaving on the table by continuing to do what you’ve already been doing? Believe me, you don’t want to learn the hard way. If I can save you even one mistake that would cost you $5,000 and countless hours of labor, would it be worth the investment? I think you would agree, the answer is obvious. As a special bonus, I’m going to give you one year of FREE support! That’s right, you have direct access to me for a whole year! This bonus alone is valued at $12,000.00 and it come FREE with the program.